The 40th year of NSSBL begins on Thursday May 19. The defending champions, the Dartmouth Moosehead Dry open the season versus the Kentville Wildcats. Game time is 7:30 at Beazley Field. This weekend the Truro Bearcats will host the Sydney Sooners in a three game series starting with a double header on Saturday, first pitch is 3pm at the TAAC Grounds. The Halifax Pelham Canadians kick off their season at home on Tuesday night against the Kentville Wildcats. The Wildcats scored two runs in the top of the ninth for the win in Dartmouth. The Wildcats visit Halifax on Tuesday night and the Dry welcome the Truro Bearcats on Thursday night. In a game which was shortened by fog, the Kentville Wildcats broke open a pitchers' duel between Alex Ostrov and Craig Field and earned a win over the Halifax Pelham Molson Canadians, 3-1. Brandon McKay knocked in a pair of Wildcats with a single and sacrifice fly while Codey Shrider scored twice and singled. Jake Pelham paced the Halifax offense with a double, single and RBI while Shawn Walsh doubled. The Wildcats are 2-0 on the young season and Halifax is 0-1. The Truro Bearcats evened their record at 2-2 after a 10-3 win in Dartmouth on Thursday night. This weekend, the Halifax Pelham Canadians host a three game series with the Sydney Sooners starting with a double header Saturday at 3pm. Game three of the series is Sunday at 1pm. In other action, the Truro Bearcats host the Kentville Wildcats for a double header on Sunday starting at 2pm. The Halifax Pelham Molson Canadians came from behind and scored two runs in the bottom of the ninth inning to earn a 4-3 win over the Sydney Sooners in game one of a twinbill on Saturday afternoon at the Mainland Common. Sydney pushed a run across in the top of the ninth and took a 3-2 lead into the bottom half. Jake Pelham stroked a walkoff two-run single making a winner of rookie southpaw Brett MacInnins who came on in relief in the eighth. Former Halifax righthander, Sheldon MacDonald suffered the loss in relief of Justin Brewer. Right-hander, Reilly O'Rourke carried a no-hitter into the seventh inning when Steve Murphy broke it up with a solid single leading to the only Halifax run of the evening. Halifax right-hander, Jordan Pelham matched his opposite number pitch for pitch as he carried a shutout into the eighth inning before tiring and allowing a leadoff walk, stolen base and an RBI single by Justin Brewer. Lefthander, Brett MacInnis entered and gave up a walk to Phil Brown before the veteran Cory Christie lofted a sacrifice fly to put the Sooners up a run. Paul MacLean finished the scoring with an RBI single making a winner of O'Rourke who allowed only a pair of singles. First pitch in the rubber game of this weekend series is scheduled for 1:00pm pm Sunday. The Sydney Sooners received another dominant pitching performance, this time from veteran right-hander, Anthony Ianetti, as they took the rubber game of the series from Halifax 6-1. Ianetti fired a complete game allowing only a first inning run on a pair of doubles from Connor Sullivan and Jake Pelham. Sean Ferguson led the way offensively with a double, two singles and a pair of RBI for the Sooners. Phil Brown also reached safely three times while Cory Christie smacked a two-run single. Sullivan, Shawn Walsh and Brandon MacKinnon had a pair of hits each for the Canadians. The game tonight between Truro and Dartmouth has been postponed due to wet field conditions. The Halifax Pelham Canadians broke a 3-3 tie in the 10th inning with two runs, but could not hold on for the victory the Wildcats scored three for a 6-5 win. (Linescore to follow) The Wildcats move to 4-1 on the season, the Pelham Canadians (1-4) face the Dartmouth Moosehead Dry tonight at 7pm at Beazley Field. For the second straight night the Pelham Canadians went to extra innings, this time they hung on for a 7-6 11inning win in Dartmouth. The Dry are seeking their first win of the year in Kentville gametime is 7pm. The Pelham Canadians are back in action Tuesday night when the host the Truro Bearcats. A pitcher's duel at Memorial Park saw both teams putting zeros up on the scoreboard until the bottom of the eighth inning, when Brandon McKay singled, advanced to 2nd on a sacrifice bunt by Jason Pleasant-Sampson. Later, scoring on a rbi double by Alex Ostrov. Liam Logan was the hard luck loser for the Dry despite only giving up 3 hits. While Shaun Tomlinson pitched 6 2/3 innings before giving way to David McIntyre who picks up the win as Codey Schrider closed out the game in the 9th for the save. The Dry are back in action Thursday night when they host Truro. The Wildcats welcome the second place Sydney Sooners for a three game series starting Friday night at Memorial Park. In other action this week, the Halifax Pelham Canadians host the Truro Bearcats Tuesday night at Mainland Commons. The Halifax Pelham Molson Canadians had a 3-1 lead over the visiting Truro Bearcats in the bottom of the 4th inning when the game was called due to fog. Truro travels to Beazley Field to tangle with the Dartmouth Moosehead Dry on Thursday night, before returning to the TAAC Grounds to face Halifax on Friday night. In other action Friday night the 1st place Kentville Wildcats host the Sydney Sooners. Both teams are at home on Tuesday night, Truro hosts Kentville and Halifax welcomes the Dartmouth Moosehead Dry. This weekend the Dartmouth Moosehead Dry will visit the newly renovated Susan McEachern Memorial Ball Park for the Sydney Sooners home opener, game time Friday night is 7:00 pm, followed by 1pm on Saturday. The Halifax Pelham Molson Canadians sent eleven men to the plate scoring seven runs in a big 4th inning to take control of what was a one-run game as they defeated the Dartmouth Moosehead Dry 9-5 on a chilly night at Mainland Common. Righthander, Craig Field was the beneficiary of the big inning as he fired 7 solid innings to earn the win before southpaw Brett MacInnis allowed two hits and a run in 2 innings of work. Brandon Devlin belted a two-run double and Pat Gilbert lined a two-run single in the big inning. Shawn Peverill knocked in a pair with three singles while Josh Pelham also knocked in two. Shawn Walsh doubled and added a pair of singles while Jake Pelham smacked two doubles for Halifax. Jordan Clyke singled twice and knocked in a pair to pace the Dry. Liam Logan suffered the loss. Truro and Kentville were rained out in Truro, no make up date has been set at this time. The Dartmouth Moosehead Dry defeated the Sydney Sooners on Friday night 2-1, the Sooners bounced back with a 3-0 win on Saturday to split the two game weekend series. Game 1: Friday June 17/16; 7:05 pm. Hitting: Sydney: Phil Brown; double, 2 singles, 2 RBI: Ken Long, double, single: Paul MacLean, RBI double. Veteran third baseman, Josh Pelham, broke open a tie game by stroking a two-out, two-run single in the bottom of the 5th inning giving the Halifax Pelham Molson Canadians a 3-1 win over the Kentville Wildcats in a game which was called due to fog in the bottom of the 6th. Connor Sullivan with three singles and Mark Pelham with two were the other top hitters for Halifax. Dryden Schofield ripped an RBI double to account for the Cats' only run off lefthander, Brandon MacKinnon, who otherwise allowed only five harmless singles. Kentville righthander, David McIntrye matched him pitch for pitch until Pelham's clutch single. Kentville returns to the diamond on Thursday night when they travel to Beazley Field to face the Dartmouth Moosehead Dry while Halifax visits Sydney for a pair on the weekend. Sydney Hands Halifax 9-4 setback in game one of Two Game Series. Halifax Offence: Mark Pelham, 2 doubles, a single, RBI Pat Gilbert, 2 singles, RBI Greg MacKinnon, Double, single, stolen base. Prior to the game, Local Municipal and Provincial Officials commemorated the renovation upgrades to the Susan McEachern Memorial Baseball Park, with an official ribbon cutting ceremony Halifax and Sydney play game two of their two game series, at 100 pm on Satiurday. Sydney Offence: Phil Brown, 2 singles; Jordon Shepherd, Jonny MacLeod, a single apiece. Halifax Offence: Shawn Walsh, 2 singles, 1 RBI; Steve Murphy, double. For the third time already this season the Pelham Canadians and Wildcats had to deal with foggy conditions at Mainland Common. Last night the game did not even start due to poor visibility, no make up date has been set at this time. Sooners batter Wildcats on Canada Day matchup. The Sydney Sooners batted around in the first inning scoring 10 runs on 8 hits racing out to a commanding lead on the Wildcats. Meanwhile on the mound, Reilly O'Rourke threw a gem by only allowing 1 hit over 6 innings for the win. Wildcats rebound for game two win in the series. The Kentville Wildcats took the early lead on a 2-run double by Dryden Schofield in the first inning. The lead grew to 4-2 for the middle frames and 7-2 late, before surviving a scare from the Sooners in the ninth where it was 7-4 and a chance to tie things up in the final inning. Wildcats win the series by closing out the finale with 7-3 win over Sooners. The Wildcats scored a run in the first inning to start things off. A 3-run second padded the lead to 4-0. The Sooners battled back with 2 runs in the 4th inning, before the Wildcats added some insurance runs (1 in 6th and 2 in the 7th) to seal the victory. The Wildcats scored first in the 2nd inning before being matched by the Canadians in the 3rd. The 5th inning saw the Cats jump ahead to 4-1 lead with the Candians scoring again in the 7th to make it 4-2 and (2) in the 8th to tie things up. The Cats pushed across a run in bottom of the 8th for a 5-4 lead headed into the 9th. The Cats went "wild" in the 9th as they walked three, gave up a couple hits and made three errors for a heart-breaking loss at home. What started as a perfect day for baseball ended in disappointment for the Wildcats and Sooners. A thunderstorm rolled into Kentville around 3pm and washed out the game. The Sooners now travel to Truro to play the Bearcats at 1pm Sunday. Losing Pitcher: Liam Logan (LP) Catcher Justin Stephens. Dartmouth Hitter: Jordan Clyke, 2 singles. Game was highlighted by a pitchers’ duel, with Sydney’s Reilly O’Rourke throwing a two hitter, and pitching to just two batters over the minimum nine inning twenty-seven. O’Rourke also had 12 strikeouts for the game. Game two of the two game set goes Saturday at 1:00 at the Susan McEachern Memorial Ball Park. Sooners improve record to 11-7, while Dartmouth stand at 10-11. Dartmouth Hitters; Chris Head, solo home run, RBI 3 other hitters with a single apiece. Sooners Hitter: Taylor Slade, 2 singles Sooners pitchers allowed only four hits, but gave up 10 wal;ks and two hit batters, to account for the difference in the score. Game Summary:	Wildcats win game #1 of double-header. The Wildcats scored 1 run in the 3rd inning and 5th innings before adding 2 more insurance runs in the 7th to stake a 4-0 lead. The Bearcats scored 1 in the 9th inning as Alex Ostrov out-duelled John Chapman for the complete game victory. Tonight's game between the Halifax Pelham Canadians and Dartmouth Moosehead Dry has been postponed due to rain. The Sydney Sooners swept the weekend series with the Truro Bearcats. Winning Pitcher: Ryan Lawless (WP), Justin Brewer (6) (Save); Catcher: Chris Farrow. Losing Pitcher: Jordan Johnson (LP), Dustin Harvie (3), Jordon McCallum (8); Catcher: Matt Mingo, Darson Murphy (3). Sydney Hitters: Jonny MacLeod: solo Home Run, 2 singles, 4 RBI Jeff MacKinnon;: Double, Single, 3 RBI, 3 Runs Scored, 2 Stolen Bases. Justin Brewer: Double, Single, 1 RBI, 3 Runs Scored. Chris Farrow: 2 singles, 2 RBI, 1 Stolen Base Jordan Shepherd: 1 single, 3 Runs scored, 1 Stolen Base. Truro Hitters¨ Jeff Chisholm: Double, 2 singles, 1 Run Scored. Darson Murphy: 2 singles, 2 Runs Scored Jason Smith: 2 singles. Anthony Ianetti, Logan Aker (3), Ken Long (5) (WP); Catcher Jordon Sampson. Jason Smith(L), Brandon Mullalay (4), Ryan Bates (7); Catcher: Scott Baillie, Jeff Chisholm (4). Halifax Offence: Shawn Walsh, 2 singles. WP: Codey Shrider, nine innings of four hit ball. 15 KO’s; Catcher Tyler Fancy. Losing Pitcher: Justin Brewer, Logan Aker (5); catcher, Jordon Sampson. Kentville Offence: Ian Lockhart, 3 singles, a double, 1 RBI Jamie MacNeil, 2 singles, run scored. Sydney Offence: Four scattered singles. Winning Pitcher: Alex Ostrov, Catcher Tyler Fancy. Losing Pitcher: Anthony Ianetti, Catcher, Sean Ferguson. Kentville Offence: Brandon MacKay, 2 singles. Sydney OPffence: Phil Brown, Paul MacLean, 2 singles apiece. Game offered a real pitchers’ dual between Ostrov and Ianetti, with Ostrov gaining the win on the backs of three consecutive infield errors by Sydney in the fifth inning, which scored both Kentville runs. Sydney Offence: Josh Pentecost, single, double, RBI Josh Forrest, 3 singles, 9th inning RBI to tie game Jeff MacKinnon; 9th inning RBI , scored winning run on wild pitch passed ball. Kentville Offence: five singles, three of them in run scoring 8th inning. In what turned in to another pitchers’ gem, Sheldon MacDonald from Sydney and Dryden Schofield hooked up in a great game, which was decided in a walk off run scored on a wild pitch pass ball in the bottom of the ninth. Sooners rallied when with two outs and one runner on Phil Brown scrambled to first on a third strike third out of the 9th inning for Sydney. With two outs, and two runners on back to back singles by Jeff MacKinnon and Josh Forrest, tied the game with Jeff MacKinnon scurrying home with the walk off win for Sydney. The Kentville Wildcats cameback from 5 down to defeat the Halifax Pelham Canadians 11-8 in 10 innings at Mainland Common. The Dartmouth Moosehead Dry won game 1 in Fredericton over Quebec. Codey Shrider (4inn, 3 ks) picked up the win in relief of Jason Mosher who went 7 strong and had 7ks. Colby Turple had a two out single and scored the winning run when Billy Hartley was hit by a pitch with the bases loaded. Former minor league pitcher Francois Lafreniere pitched 10 1/3 innings, struck out 15 and picked up the loss. Jordon Pelham was player of the game for the Dry with 2 hits and solid D in CF. Game 2 is at 3pm vs Ontario 2. The Dartmouth Moosehead Dry were one hit away from finishing first in their pool but instead were eliminated as they did not win a tie-breaker for 3rd place. The Dry were down 3-2 in the final inning vs host Fredericton and loaded the bases with 1 out, but could not bring the tying or winning run across. The win would have gave them a 3-1 record, which could have earned them a bye to the semi-finals. The Dry needed Ontario 2 to beat Quebec which would see the Dry finish 3rd and advance to the Quarter finals. But Quebec broke a 3-3 tie in the final innning for a 6-3 win. The result put Ontario2, BC and the Dry all tied at 2-2 with two spots available in the playoffs. The tie-breaker was defensive runs per inning amongst the tied teams. The Dry had the worst ratio as they lost 10-3 to Ontario2 on Thursday. Sydney win will clinch 1st place, and create a tie for second place, Dartmouth will finish 2nd based on head to head season series and Kentville would finish 3rd. Truro will play the Sooners in round 1. Kentville win create a tie for 1st place and the Wildcats have the season series over Sydney, Sydney 2nd and Dartmouth 3rd. The playoffs will begin next week. Truro will play Kentville in round 1. The Dry await the winner of the Kentville and Sydney game Saturday night to determine their first round matchup. A Sooner win would set up a Dry vs Wildcats series with Dartmouth holding home field advantage based on their regular season head to head. The Sooners would take on the Truro Bearcats. A Wildcats win would clinch 1st place over Sydney based on their head to head record during the regular season. The Sooners and Dry would meet with Sydney having home field advantage. The Wildcats win creates a tie for 1st place with the Sooners. The Wildcats take the tiebreaker because of a 5-2 record vs the Sooners this season. The Wildcats will take on the fourth place Truro Bearcats. The Sonners will play the Dartmouth Moosehead Dry. Both series will be a best of five format. Schedules should be announced shortly. Colby Turple 3 singles, Joey Cavadini 2 singles, Ian Lockhart 2 singles, Alex Ostrov single and 3 walks	Codey Shrider losing pitcher 17 K's!!! In the 10th inning, Jeff Chisholm singled and later scored the 3-2 winning run on a Dan Bates double. The Wildcats tried to answer back but came up empty to end the game. Tonights game in Kentville has been suspended because of rain. The game will resume in the top of the 3rd inning with the Truro Bearcats leading 2-1 on a Jeff Chisholm two run home run in the 1st inning. John Chapman started for Truro and Alex Ostrov took the mound for the Wildcats in a rematch from game 1. The Bearcats lead the best of five semi-finals 2-0 and can clinch a berth in the finals with a win. Sydney and Dartmouth resume their series on Saturday in Sydney at 3:30p as the Dry lead that series two games to none. The Truro Bearcats completed a three game sweep of the Kentville Wildcats in the semi-finals. The Bearcats came into Thursday night with a 2-1 lead in the top of the 3rd as the game was suspended from Wednesday night. John Chapman pitched a complete game 3 hitter for a 6-1 win. The Bearcats await the winner of the Dartmouth and Sydney series which continues on Saturday in Sydney. The Dry lead 2-0. The Dartmouth Moosehead Dry completed a three game sweep of the Sydney Sooners with a 1-0 win in 12 innings. The win sets up a rematch from last years final with the Truro Bearcats. Jason Mosher picked up the win pitching 11 1/3 innings of shutout ball. Sheldon Macdonald matched zeros and pitched an impressive 10 innings for the Sooners. Logan Aker pitched two innings and gave up the games only run that came on a single by Anthony MacKinley which scored Dave Wallace with the winning run in the 12th inning, Wallace had singled with one out and stole second base to get in scoring position. Justin Davies entered the game with one out and a man on base to record the last two outs of the game. Sydney had the tying run on second when Justin Brewer flew out to right field to end the season for Sydney. Winning Pitcher: Jason Mosher, 12 KO’s; (W), Justin Davies (12,save) and Justin Stephens. Losing Pitcher: Sheldon MacDonald, Logan Aker (11) (L) and Sean Ferguson. Dartmouth Hitters: Dave Wallace, 2 singles. Sydney Hitters: Jordan Shepherd, 2 singles. CATCHER: JUSTIN STEPHENS D .237 batting average. SECOND BASE: MATT DOUDELET D: BA: .323; seventh in league batting; tied for second in doubles with 9. SHORTSTOP: DAVID WALLACE D BA: .350; third in stolen bases with 18. THIRD BASE: JOSH PELHAM H BA .318; third in hits with 34; sixth in RBIs with 20. DESIGNATED HITTER: GUY PELLERINE T BA .349; second in RBIs with 28; third in batting with a .349 average. DARSON MURPHY T Batting champion with a .424 average; first in hits with 50; second in runs scored with 33; tied for first in triples with 2. CHRIS HEAD D BA. .315; first in runs scored with34; first in doubles with 10; leader in home runs with 5; leader in stolen bases with 28; second in hits with 39; tied for fourth in RBIs with 22. PHIL BROWN S fifth in batting with a .324 average. RHP: JASON MOSHER D 9 wins and 1 loss; led the league in winning percentage with a .900 mark; leader in wins with 9; leader in Ks with 90; second in innings pitched with 95.1. LHP: BRANDON MAC KINNON H 5 wins and 1 loss; second in winning percentage with.833; second in Ks with 67; second in ERA with 2.52; third in innings pitched with 71.; tied for fourth in wins with 5. COACH OF THE YEAR: IAN MOSHER K Directed the Wildcats to a first-place tie with Sydney with a 28-8 record. ALEX OSTROV K 8 wins and 5 losses; first in innings pitched with 96.1; second in league wins with 8; fourth in Ks with 60; sixth in winning percentage with .615; ERA 3.18. Offensively: 18 hits in 67 at bats for a .269 average. Game 2 has been postponed due to rain. It has been rescheduled to Saturday, September 24th in Truro at 7:30pm. Game 3 goes tonight at Beazley Field at 7pm. The Dartmouth Moosehead Dry have won their unprecedented 19th Nova Scotia Senior Baseabll league Championship in the 27 year history. HITS: Darson Murphy T; Chris Head D 39; Josh Pelham H 34; Jeff Chisholm T 34; Phil Brown S 34. RUNS: Chris Head D 34; Darson Murphy T 33; Chris Farrow S 28; Jeff Chisholm T 27. RBI: Greg West D 30; Guy Pellerine T 28; Dan Bates T 23; Chris Head D 22; Jeff Chisholm T 22; Josh Pelham H 20. DOUBLES: Chris Head D 10; Matt Doudelet D 9; Colby Turple K 9. TRIPLES: Colton Beach T, Darson Murphy T, Jordon Shepherd S and Jonny MacLeod; each 2. SB: Chris Head D 28; Chris Farrow S 22; David Wallace D 18; Ryan Bates T 15. WINS: Jason Mosher D 9; Alex Ostrov K 8; John Chapman T 6; Brandon MacKinnon H 5; Reilly O’Rourke 5. Ks: Jason Mosher D 90; Brandon MacKinnon H 67; Codey Shrider K 62; Alex Ostrov K 60. ERA: John Chapman T 1.62; Brandon MacKinnon H 2.52. INNINGS PITCHED: Alex Ostrov K 96.1 Jason Mosher D 95.1; Brandon MacKinnon H 71.1; Craig Field H 66.2; John Chapman T 61. SAVES: Dan Bates T 5; Codey Shrider K 4. Darson Murphy T 47; Chris Head D 34; Jeff Chisholm T 32; Josh Pelham H 31; Phil Brown S 30. RUNS: Darson Murphy T 33; Chris Head D 29; Jeff Chisholm T 27; Chris Farrow S 26. RBIs: Guy Pellerine T 26; Greg West D 24; Jeff Chisholm T 22; Dan Bates T 22; Chris Head D 20. DOUBLES: Chris Head D 9. TRIPLES: Colton Beach T 2; Jordon Shepherd S 2; Johnny MacLeod S 2. HOME RUNS: Chris Head D 5; Dan Bates T 3. SB: Chris Farrow S 21; Chris Head D 20; Ryan Bates T 15; David Wallace D 14; Kenny Long S 14; Jeff MacKinnon S 13. WINS: Jason Mosher D 8; John Chapman T 6; Alex Ostrov K 6. Ks: Jason Mosher D 81; Brandon MacKinnon H 58; Reilly O’Rourke S 43; Alex Ostrov K 43; Codey Shrider K 43; John Chapman T 39; Anthony Ianetti S 33. ERA: John Chapman T 1.38; Brandon MacKinnon H 2.52. INNINGS PITCHED: Jason Mosher D 87; Alex Ostrov K 71.2; Brandon MacKinnon H 69.1; Craig Field H 58.2; John Chapman T 52; Reilly O’Rourke S 51. HITS: Darson Murphy T 42; Jeff Chisholm T 29; Chris Head D 28; Phil Brown S 28; Guy Pellerine T 27; Shawn Walsh H 26; Dan Bates T 26. RUNS: Darson Murphy T 31; Jeff Chisholm T 26; Chris Farrow S 26; Chris Head D 25. RBIs: Guy Pellerine T 24; Greg West D 24; Dan Bates T 22; Jeff Chisholm T 21. DOUBLES: Jeff Chisholm T, Colby Turple K, Dan Bates T, Matt Doudelet D: each with 7. TRIPLES: Colton Beach T, Johnny MacLeod S and Jordon Shepherd S: each with 2. HOME RUNS: Chris Head D and Dan Bates T; each with 3. SB: Chris Farrow S 21; Chris Head D 20; Ryan Bates T 14; Kenny Long S 14; Jeff MacKinnon S 13; David Wallace D 12. WINS: Jason Mosher D 7; John Chapman T 6; Alex Ostrov K 6. Ks: Jason Mosher D 77; Reilly O’Rourke S 44; Alex Ostrov K 43; Brandon MacKinnon H 39; John Chapman T 39. ERA: John Chapman T 1.38; Brandon MacKinnon H 2.72. INNINGS PITCHED: Jason Mosher D 79; Alex Ostrov K 71.2; John Chapman T 52; Craig Field H 49.2; Reilly O’Rourke S 48; Brandon MacKinnon H 46.1. SAVES: Codey Shrider K 4; Dan Bates T 4. HITS: Darson Murphy T 37; Chris Head D 26; Shawn Walsh H 25; Dan Bates T 25; Josh Pelham H 24. RUNS: Darson Murphy T 26; Chris Head D 22; Jeff Chisholm T 22. RBIs: Greg West D 22; Dan Bates T 21; Guy Pellerine T 19; Jeff Chisholm T 16. DOUBLES: Dan Bates T 7; Colby Turple K 7; Anthony McKinley D 6; Jeff Chisholm T 6. TRIPLES: Colton Beach T 2. HOME RUNS::Dan Bates T 3; Chris Head D 3. SB: Chris Farrow S 18; Chris Head D 17; Ryan Bates T 12; David Wallace D 12; Kenny Long S 11. WINS: Jason Mosher D 7; John Chapman T 6; Alex Ostrov K 5. Ks: Jason Mosher D 68; John Chapman T 38; Brandon MacKinnon H 34; Alex Ostrov K 32; Codey Shrider K 31. ERA: John Chapman T 1.41; Brandon MacKinnon H 2.90. INNINGS PITCHED: Jason Mosher D 72; Alex Ostrov K 57.2; John Chapman T 51; Craig Field H 48.2; Reilly O’Rourke S 46. SAVES :Colby Shrider K 3; Dan Bates T 3. LEADERS HITS: Darson Murphy T 28; Dan Bates T 22; Greg West D 21; Shawn Walsh H 21; Kenny Long S 20; Chris Farrow S 20. RUNS: Darson Murphy T 22; Chris Farrow S 22; Jeff Chisholm T18; Chris Head D 17; Dave McIntyre K 13; John Chapman T 13. RBIs: Dan Bates T 19; Greg West D 18; Guy Pellerine T 15; Ryan Bates T 14; Jordon Shepherd S 13; Colby Turple K 12. DOUBLES: Dan Bates T 6; Shawn Walsh H 5; Josh Forrest S 5; Colby Turple K 5. TRIPLES: No leader; several with 1. HOME RUNS: Dan Bates T 3; Chris Head D 2; Justin Stephens D 2; Jeff Chisholm T 2; Jordon Shepherd S 2. SB: Chris Farrow 18; Ryan Bates T 12; Chris Head D 10. Ks :Jason Mosher D 58; John Chapman T 32; Anthony Ianetti S 32; Brandon MacKinnon H 31; Alex Ostrov K 28; Codey Shrider K 27; Reilly O’Rourke S 25. ERA: John Chapman T 1.10; Brandon MacKinnon H 2.41; Jason Mosher D 3.14; Anthony Ianetti S 3.43. INNINGS PITCHED: Jason Mosher D 63; Alex Ostrov K 48.2; Anthony Ianetti S 42; John Chapman T 41. SAVES: Codey Shrider K 3. LEADERS HITS: Darson Murphy T 21; Phil Brown S 20; Shawn Walsh H 16; Jordon Shepherd S 15’ Greg West D 15; Shawn Peverill H 15. RUNS: Chris Farrow S 17; Darson Murphy T 14; Jeff Chisholm T 13; Chris Head D 10; Shawn Peverill H 10. RBIs: Ryan Bates T 14; Guy Pellerine T 12; Dan Bates T 10; Greg West D 9; Jordon Shepherd S 9. DOUBLES: Shawn Walsh H 5; Dan Comeau D 4; Chris Head D 4; Connor Sullivan H 4; Alex Ostrov K 4; Matt Mingo T 4. SB: Chris Farrow S 13; Ryan Bates T 8; Kenny Long S 7; Jordon Shepherd S 7. LEADERS HITS: Phil Brown S 18; Darson Murphy T 18; Connor Sullivan H 15; Shawn Walsh H 15;Josh Pelham H 14; Kenny Long S 13;Shawn Peverill H 12; Jeff Chisholm T 12; Dan Bates T 12. RUNS: Darson Murphy T 13; Guy Pellerine T 13; Chris Farrow S 12; John Chapman T 9; Dan Bates T 9. RBIs: Guy Pellerine T 11; Dan Bates T 10; Ryan Bates T 10. DOUBLES: Shawn Walsh H 5; Dan Comeau D 4; Connor Sullivan H 4; Matt Mingo T 4. TRIPLES: Jordon Shepherd S 3. HOME RUNS: No leader: several with 1. SB: Ryan Bates T 8; Phil Brown S 8; Kenny Long S 6; Jordon Shepherd S 6; Chris Head D 4. WINS: Anthony Ianetti S 3; Reilly O ‘Rourke S 3; Jason Mosher D 3; John Chapman T 3. Ks: Jason Mosher D 37; Brandon MacKinnon H 21; Reilly O’Rourke S 20; John Chapman T 19; Anthony Ianetti S 19; Alex Ostrov K 18; Codey Shrider K 17. ERA: Brandon Mackinnon H 1.17; John Chapman T 1.73; Anthony Ianetti S 2.25; Codey Shrider H 2.40. INNINGS PITCHED: Jason Mosher D 37.2; Alex Ostrov K 28.2; Anthony Ianetti S 28; Justin Brewer S 28; Craig Field H 28. SAVES: Codey Shrider K 2. HITS: Darson Murphy T 15: Jeff Chisholm T 11: Connor Sullivan H 11: Josh Pelham H 11: Dan Bates H 11. RUNS: Darson Murphy T 12: Chris Farrow S 8: Shawn Peverill H 8. 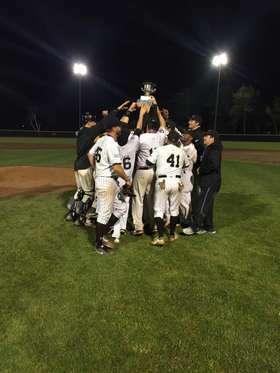 RBIs: Ryan Bates T 8: Guy Pellerine T 7: John Chapman T 6: Sean Ferguson S 5; Justin Brewer S 5: Jeff Chisholm T 5: Shawn Peverill H 5: Shawn Walsh H 5. DOUBLES: Connor Sullivan H 4. TRIPLES: Jordon Shepherd S 3. HOME RUNS: No leader: several with 1. SB: Kenny long S 5; Ryan Bates T 5: Chris Farrow S 4: Jordon Shepherd S 3. John Chapman T 3: Pat Gilbert H 3. WINS: Codey Shrider K; Brett Mc Ginnis H: Reilly O’Rourke S; Anthony Ianetti S: Alex Ostrov S: John Chapman T: each with 2 wins. Ks: Jason Mosher D 21; Brandon MacKinnon H 20: Codey Shrider K 13: Alex Ostrov K 13: john Chapman T 12: Reilly O’Rourke S 11: Anthony Ianetti S 11. ERA: John Chapman T 1.20: Jordan Pelham H 2.75: Codey Shrider K 2.77. INNINGS PITCHED: Alex Ostrov K 21.1: Jason Mosher D 20.1: Brandon MacKinnon H 20: Jordan Pelham H 19.2: Reilly O’Rourke S 18.1: Anthony Ianetti S 18. SAVES: Johnny MacLeod S: Dan Bates T: Codey Shrider K: each with 1. HITS: Darson Murphy T 15: Josh Pelham H 12: Shawn Walsh H 12: Kenny long S 12: Phil Brown S 12: Jeff Chisholm T 11: Dan Bates T 11: Shawn Peverill H 11: Ryan Bates T 10: Connor Sullivan H 10. RUNS: Darson Murphy T 12: Chris Farrow S 9: Shawn Peverill H 8: Kenny Long S 7: John Chapman T 7: Jeff Chisholm T 7: Dan Bates T 7: Jake Pelham H 7. RBIs: Ryan Bates T 8: Shawn Peverill H 7: Dan Comeau D 5; Josh Pelham H 5: Shawn Walsh H 5: Jake Pelham H 5: Justin Brewer S 5: Sean Ferguson S 5. DOUBLES: Shawn Walsh H, Connor Sullivan H and Dan Comeau D: each 3 TRIPLES: Jordon Shepherd S 3. HOME RUNS: No leader: several tied with 1. SB: Kenny Long S 5: Chris Farrow S 5: Ryan Bates T 5: John Chapman T 3: Pat Gilbert H 3: Phil Brown S 3: Jordon Shepherd S 3. WINS: Anthony Ianetti S 3: Jason Mosher D 2: Brett McInnis H 2: Reilly O’Rourke S 2: Codey Shrider K 2: John Chapman T 2: Alex Ostrov K 2. Ks: Jason Mosher D 31: Anthony Ianetti S 18: Brandon MacKinnon H 15: Alex Ostrov K 13: Codey Shrider K 12: Justin Brewer S 12: John Chapman T 12. ERA: Brett MacKinnon H 1.12: John Chapman T 1.20: Anthony Ianetti S 2.33: Jordan Pelham H 2.75: Jason Mosher D 2.76: Codey Shrider K 2.77. INNINGS PITCHED: Jason Mosher D 29.1: Anthony Ianetti S 27: Justin Brewer S 25: Alex Ostrov K 21.1; Craig Field H 21: Jordan Pelham H 19.2: Liam Logan D 19.1; Reilly O’Rourke S 18. SAVES: Dan Bates T, Codey Shrider K and Johnny MacLeod S: each 1.